I often wonder what it is that makes some people spend their whole lives searching for truth or enlightenment. For myself, I believe it was an effort to justify the feeling of being ‘different’ from those around me. Now I can accept that I am neither better or worse than those around me. I am simply fascinated by the challenge of making sense of a very complicated universe. My own father disparaged the idea of any fairness in the world. I disagreed totally. Intuitively, it seemed to me that there had to be a pattern and a plan to the world. In the ideas of spiritual evolution and reincarnation, I saw a process that might make sense of all the suffering around me. Strangely, it was the writings of Aleister Crowley that persuaded me that we had much more power over our lives than most of us realised. Were all those who claimed to witness miraculous healing and other strange happenings totally deluded? I began to experiment with magic, while still making a determined study of the various schools of psychology. I read the tarot cards for many people and I was puzzled by the incredible accuracy of the readings. I wondered if it was telepathy. I used to sit upstairs on a bus, as it slowly travelled through the centre of Dublin and stare at people to see how many became aware of my gaze. Over sixty percent of people looked around immediately. About another twenty percent looked around before the bus passed them, but too late to count as a “hit”. But, simple telepathy had to be ruled out by the many occasions that confirmations came long after I had given tarot readings. The ‘I Ching’ proved a useful Oracle, and the appropriateness of the hexagrams was impressive. Obviously, there is some mechanism by which people may steer their way through life, but if people had power, why did they so often fail to use it in their own favour. Were we truly choosing our own path to pay back some sort of Karmic debt/. The idea of souls choosing the challenges of their next life is quite a common one. Or was it just some type of divine punishment for past mistake and crimes? I really could not decide. Scattered memories across the span of time. Do I dream?, or are they fleeting glimpses of a stream of lives that really were. So many wars, as if the lust for blood has run unceasingly throughout my veins. So much violence, all too many suicides, and so much pain. Have I truly learned from all of this, or was it all in vain?. Are there lessons I must learn again, and yet again? This vessel I inhabit, this aging body, I call me. Is all That I am certain of, the rest is gone, or yet to be. This body is my altar, this mind is all I know. This fading life, the only one I now possess. The only path I have to go. Though this path be strewn with petals, or with thorns, this path is mine. But, it is my choice to play the hero or the villain, or to dull the pain with wine. Sometimes on those dark and dreadful days, I wish this trail of tears would end. Those morbid times I wonder if the gods and Goddess truly are my friends. Those awful days that sorrow seems to have no end. Then those, days of glory, dawn with pink and golden rays that turn the world into a wonderland. Or clear, still nights beneath a bright expansive moon, that paints the trees with silver strands. Those times when possibilities are shining for us bright and clear. Then, suddenly, the path ahead of us seems very clear. By the age of sixteen I was living what was almost a schizophrenic existence. I was working, in what was then, a highly paid job for a manual worker. A good friend and mentor, Norman Croakes, was a shop steward where I worked and also a member of the communist party. We spent many breaks discussing socialism and politics. And usually after work, I would spend the rest of the day drinking with workmates. My mother had never recovered from her grief, and had relapse after relapse, and would end up being signed into hospital for her own protection. Each time I would clear all the unpaid bills and try to establish some type of normality at home. In the writings of Carl Jung, I found a mysticism that tried to keep its feet on the ground, and began to understand the difficulties of building a rapport with our own subconscious mind. I found in the concept of the ‘Racial Unconscious’, a posible pattern which could explain much of what was considered ‘paranormal’. If we are all linked, then the information I received by Psychic means was a function of, as yet, unknown scientific laws. I felt that, perhaps, we were causing our own suffering because of unresolved conflicts. One thing was certain, we are not ever as rational as we believe or in total control of our own actions. I wondered if magic and ritual were attempts to build that rapport and control our own futures. According to “The Golden Dawn” , the gods exist but man created them,- it seemed to me, that if we were truly powerful spiritual beings who choose to struggle for some higher purpose, then we could end our own suffering at any time,- if only we could remember who we really are. A summer breeze sends fluffy clouds across a pale blue sky that scarcely shades the sun. To leave my cares and woes behind and wallow in their beauty and their scent until this blessed day is done. Just rest a while, our little friend, as if the beauty of this day may never end. Another day, another life, another world, another way to be. Intermingling with the waterfalls of the world, Rainbow blesses us with the communion of water and sunlight in a magickal display of shimmering iridescent colours. Rainbow is a visual and meteorological phenomenon, sparking the mind of man to heights of wonder and illumination. Natural rainbows are caused by refracted light in atmospheric water drops at a specific angle relative to the sun’s rays, appearing as a reflected spectrum of coloured light in the sky. Transparent crystal is another organic element emanating prismatic Rainbow light. Its mineral structure of flat and sharp angles offer white light waves the ability to bend in two ways: by refraction, where rays are transmitted through the crystal and dispersed; and reflection, where rays are mirrored and bounced back outwards. Rainbow covers a continuous spectrum of approximately 100 detectable hues, with the seven primary colours – red, orange, yellow, green, blue, indigo, and violet – being the most visually prominent. It is this stunning chromatic marvel that has delighted us since time began. Even before the classic Greek scholar, Aristotle, first took note and devoted serious attention to Rainbow, we have been enamored with all forms of her magickal marriage of translucent water and light, gifting us with a miraculous visual display of dancing coloured jewels. I am here, shining for you! In all your sparkling colour! You are One with Me! Rainbow while carrying messages from the gods to mortals, linking them from the profane to the sacred. Journeying to the lower realms from the heavens, Iris manifested the celestial, radiant grace of Rainbow, blessing and pouring her light upon humanity with compassion, beauty, and love in the understanding of the heart through the emotions. Thus, Goddess Iris was the embodiment of feelings, expressing her divinity as the multicoloured, faceted Radiant Rainbow of human qualities of consciousness. The ancient Chinese philosopher, Lao Tzu, wrote, “There are many paths to enlightenment. Be sure to take one with a heart.” As we look to the compassionate Goddess Iris in the brilliant Rainbow light of our heart, we can see that our beauty, too, is infinite, with no beginning and no end, extending outwards and touching all life. This is the natural expression of our True Self, in the highest form of who we really are. As Radiant Rainbow showers us with infinite blessings of the heart, our eyes can behold the miracle of this sacred truth. Prismatic Light – the dispersion of white light into separate colours as expressed in the study of optics in relationship with a transparent element of matter, i.e., water droplets, crystal minerals, etc. The division of colour by a prism is achieved when a white light wave bends and refracts, or reflects like a mirror, into its spectral components – all colours of Rainbow. Radiant Rainbow’s prismatic light is synonymous with the infinite qualities of our Spirit within, shining outwards. These beautiful facets of our soul are Love in all its forms: joy, grace, blessings, gratitude, peace, harmony, unity, truth, beauty, wisdom, freedom, abundance, praise, inspiration, magick, power, glory, etc., uniting us to our spiritual source. When we begin creating and feeling the expansion of these virtues, they in turn are reflected outward and gifted back into the Universe. Our lives can then change in the most exquisite ways. 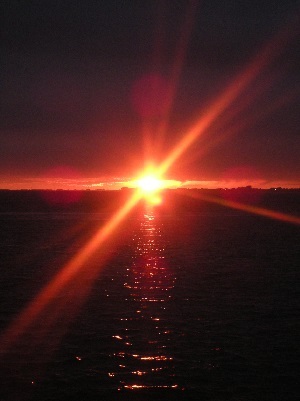 We feel en-lightened, as a lightness of Spirit enters our lives, and inner and outward radiance becomes the norm. “Nirvana or lasting enlightenment or true spiritual growth can be achieved only through persistent exercise of real love”, shares M. Scott Peck, American psychiatrist and author of the best-selling book, “The Road Less Traveled”. Radiant Rainbow is the alchemy of Love – the white light of our divinity creates the beautiful colours of self, illuminating outwards. This transcendent light of the soul does not discriminate on whom it shines – all who are in its path receive its glorious colours of reflection. In the charming 1960 Disney film, “Pollyanna”, a sweet, endearing girl gave the brightest light of herself to whoever was within her life field. She made it her personal goal to visit a grumpy old woman, Mrs. Snow, with an endless list of self-imposed ills due to her negative temperament. In her ever-optimistic, effervescent nature, Pollyanna hung crystals in Mrs. Snow’s bedroom to share the joy and brightness of rainbows. The crystals shone with a vibrant luminosity throughout the room, reflecting Pollyanna’s inner glow, and in time, her light could not be denied by Mrs. Snow, who embraced the child with love. By her very lightness of being, Pollyanna reflected the essence of spirit outward and touched endless lives. This is the Gift of Enlightenment offered to us all. Rainbow Fish – (Melanotaeniidae) a family of small freshwater schooling fish, whose iridescent scales change colour when light is reflected on them. In the beloved award-winning children’s book, “The Rainbow Fish”, author Marcus Pfister wrote a charming story about a dazzling but selfish fish, who finds friendship and happiness when he learns to share his gifts of beauty. Covered with shimmering rainbow scales, he is asked by other sea creatures if they could have one of his scales, but he is proud and refuses to share. As a result, he loses the company of others, and instead lives alone with his own conceit. Soon, he realizes the pain of loneliness and begins to discover the joy of giving, joining the graceful universal flow of giving and receiving. “The Rainbow Fish” is truly a simple tale with a powerful message: Enlightenment is realized through sharing our beautiful and unique gifts of self with others. Our gifts, like those of Rainbow Fish, are multi-coloured, radiating the infinite light of Spirit from within. In “Awakening the Buddha Within: Tibetan Wisdom for the Modern World”, the first comprehensive book on Western Buddhism for the modern-day spiritual seeker, Lama Surya Das, American-born lama and teacher wrote, “Enlightenment is not about becoming divine. Instead it’s about becoming more fully human. . . It is the end of ignorance.” This is the essence of our Radiant Rainbow within, as we generously shine our light out into the world to be shared by others, through all the spectral colours of our Beautiful Being! Iris – (Irideae) a genus of up to 1,000 species of perennial fan-shaped multi-coloured flowering plants. The name Iris is derived from the Greek word meaning “rainbow”, referring to its wide variety of flower colours among the many species. As such, Iris’ beauty is showcased extensively as an ornamental plant in both home and botanical gardens worldwide. Rich in universal symbolism and artistic portrayal, Iris has been portrayed and admired in literature and paintings, as well as used for stylized commercial logos, emblematic flags, and political and family coat-of-arms. Iris’ flower essence is particularly beautiful as a rainbow-bridge between earth and sky, body and soul, and the temporal and spiritual worlds, reminding us of our divine origin and link with the timeless universe. Pondering this truth can inspire us to heights of beauty, grace, and creativity, restoring the magnificent shining light of our beautiful Infinite Self. Iris offers us the flowering of our intuitive soul along the colourful spectrum of feeling, which blossoms in the heart of love. In the revered epic Sanskrit Hindu sacred scripture, Bhagavad Gita, it sublimely states, “To the illumined man or woman, a clod of dirt, a stone, and gold are the same.” This jewel of wisdom points to Iris’ soul, who shows us that all life is One – we are all borne from, and embody, Spirit. This is the brilliant healing path of our inner Radiant Rainbow, guiding us to and through the great Gift of Enlightenment. Rainbow Opal – a brilliantly hued blue gemstone with curved flashes of rainbow color. Rainbow Opal, the sacred stone of Goddess Iris, is known as the “stone of the Gods”, personifying the mysteries of the cosmos, momentarily revealed to humanity through its sparkles of iridescent light. 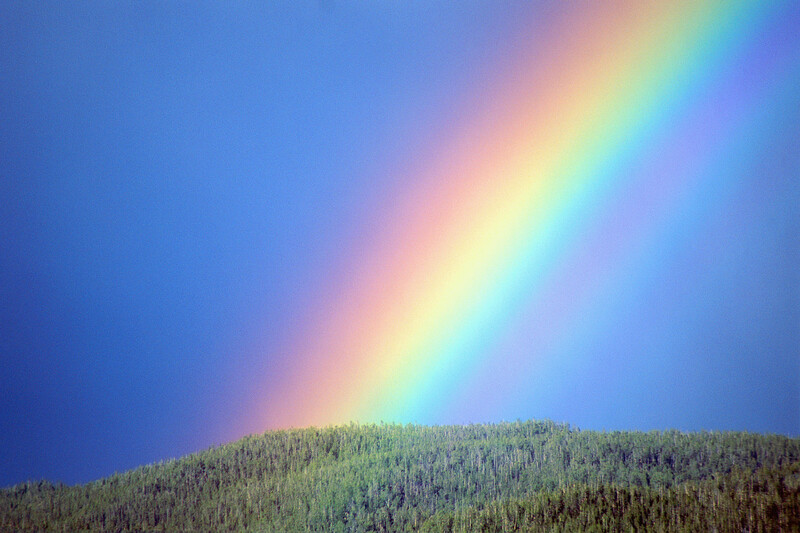 This is the divine power of Rainbow, as it unites the universe with the earth. As we look in wonder at its luminous, transparent glimpse into the heavenly realm, for a few brief moments we are seeing beyond the physical into the kingdoms of nature and life, and a spark of Enlightenment can unveil itself within. This flash of illumination can help us better understand our intrinsic gift of intuition, and life’s inherent forces of mysticism and shamanism. As such, Rainbow Opal is known to be the most powerful of healing stones. As a stone of hope, it symbolizes a renewed feeling of optimistic expectation, or faith, when we gaze upon the spiritual blessings of Rainbow’s shimmering essence of celestial light intermingling with our world. “To hope and dream is not to ignore the practical. It is to dress it in colors and rainbows,” shares best-selling author Dr. Anne Wilson Schaef, described as having the vision of an eagle, and one of the most important thinkers of our time. This is the essence of Radiant Rainbow’s gift, the proverbial Pot ‘o Gold at the end of the Rainbow! To raise us up, to behold the luminous colourful jewels that life has to offer! So, Darlings…Let us Shine On! Moving through the spiritual energy of our own totem inner Radiant Rainbow, we can be blessed with the precious Gift of Enlightenment in conscious compassion to all life. Here, within the realm of Divine spectral light, our True Self eternally dwells. A personal ceremony can be performed to enhance the manifestation and integration with Rainbow’s all-embracing gift. This can be a private celebration between yourself and Rainbow Spirit, or you can invite others to join. It can be as ritualized as you desire, or naturally free-flowing, and include anything you want to say or any object(s) that intuitively feels in harmony with the act of thanksgiving for Radiant Rainbow’s blessing. A powerful place to hold the celebration would be in a natural area with a spacious sky among Rainbow’s presence, but physical location is not of prime importance. If you do not have access to this environment, any contact outside facing Rainbow’s auric essence would be helpful. If the celebration is held indoors, being in room with a window is encouraged to enhance the presence of natural elements, but if this is not possible, symbolically facing Rainbow would be beneficial. Even if this locality is hidden or at a great distance, emanations from Radiant Rainbow’s spiritual source are not obscured, as they flow freely throughout the Universe. As a sample list, any of the following ideas below could be included in your celebration, and verbalized during a Blessings of Intention for Enlightenment affirmation ceremony (see below). Also, any of these offerings may be created and integrated into your ritual either physically and/or symbolically in Spirit. Begin with a personal intention of Enlightenment to enhance any general or specific aspect of your life. Light a bright or rainbow-coloured candle to symbolize the bright and beautiful essence of Goddess Iris, as she guides you to raise your consciousness into the light of the heavenly realm. Visualize the infinite colours of Prismatic Light, reflecting your inner beauty outwards to all life. Honor the shimmering Rainbow Fish, who shares the unique light of his great Gift of Self with others. Feeling the transcendent essence of Iris, either with a drop of flower essence on the tongue or holding the flower, which can open your heart to the divinity of all life. Hold the iridescent gemstone Rainbow Opal, or any other stone resonating the great gift of faith and hope. Other related stones include Pearl, Rainbow Moonstone, Rainbow Quartz Crystal, Rainbow Jasper, and Selenite. Proclaim intentional blessings for the Gift of Enlightenment. A simple statement in the form of a heart-felt declaration can attract and summon the heights of magick and power through the fundamental, positive act of intention. By the sincere act of a clear and pure desire, a personalized blessing can call upon the spiritual forces of unity within life – the source of your Infinite Self. You can use any of the following Blessings of Intention affirmations as a guideline to be included into your own personal declaration towards inner harmony and integration with the energies of Heaven and Earth. Written as non-denominational statements, these intentional blessings can be practiced by any single person, or unstructured or organized group, as their own personal form of prayer, charm, chant, invocation, or medicine, etc. A devotional affirmation of praise, honor, and thanksgiving, as suggested in Dream Song to Radiant Rainbow (see below). This act of appreciation is enhanced with the powerful personal statement “I Am”, and especially when said aloud, can invoke the creative energies of manifestation radiating throughout the Universe, calling upon Rainbow’s Great Spirit to be infused into your life. All or part of the Dream Song passages can be included in this holy prayer of purpose and gratitude. Their power summon and embrace a wide range of natural spiritual influences, ancient mythology, and alchemical life-force energies from Native American, Deity, Celtic, Shaman, Indigenous, Pagan, and Wiccan cultures. * With this shimmering candle, blessed by Rainbow Spirit, I embrace the iridescent beauty of Goddess Iris, guiding me to the light of my True Self shining within my heart and soul. radiate the beautiful colours of Love illuminating my heart and soul. Gifts of Being joyfully swimming in my heart and soul. Divine, and this cosmic connection blossoms within my heart and soul. I see myself in You! All the colours that I am, are in You! And I shine this out into the world. And am One with You. I recently had a conversation with a friend concerning another’s opinion of me which centered around the observation of my state of enlightenment or more precisely my lack there of. Although I disagree with the general assessment and personal bias the individual held against me, it did motivate a personal introspection and consideration of what I defined as enlightenment. What was my definition of the word? And how did my comprehension align or misalign with others’ perception? Where did I get to this understanding from? Was it my own or did I adopt it from another source? When researching enlightenment I began with finding the basic definition. The word literally means illumination or spiritual awakening. This is what I understand the basic concept of enlightenment to mean. When an individual is awakened and realizes the truth of the greater reality that most others on the planet Earth do not perceive, they have become enlightened. Individuals with knowledge of this may have reached this point of their personal soul evolvement, however it is not the sole determinator. Neither is having visions or other supernatural experiences nor is living in a perpetual state of ‘bliss’. Being truly enlightened is about more than all that. It is the complete and perfect realization of the state of one’s true self or nature, stripped of all social conditioning that we acquired as we lived on this physical plane of existence. It is the ability to view and comprehend the limitless transcendental reality of all that was, is and ever will be with the understanding that the individual known as ‘I’ is just a speck in the vast web of the universe. An individual who is fully enlightened has gained insight into the human mind, which has the distinct ability to keep us trapped within a purely physical reality. When the state of enlightenment is reached all obstacles and limitations have been removed and the enlightened individual understands the positive influence that all human beings have over their own life experience. When In this state there is infinite compassion, wisdom and love for all beings. This is what I believe the state of enlightenment consists of and these ideas aligned with the majority of information I gathered when researching the concept. My thoughts about enlightenment have changed over time as I evolved spiritually and at this point in my spiritual evolvement I find that my beliefs are more aligned with Buddhism than with other spiritual path. My definition and understanding is more in depth than that which I was given by the observer of my behavior. It was their opinion that enlightenment consisted of being open-minded and of knowing that there were many paths that lead to the same conclusion. While I agree that this is part of the process to enlightenment it is not the whole entirety of it. Enlightenment is greater than a general understanding of religion or spirituality. It is a state of being. For the individual who has attained perfect enlightenment, it is nothing and everything. been down that road before. the self. Every path has a hint of Wisdom, if we look it lurks behind every corner of every path. genuinely it is well worth the time in the long run. many stages and is a life time goal and dream to many magick practitioners .